Photo by David Paul Bayles. 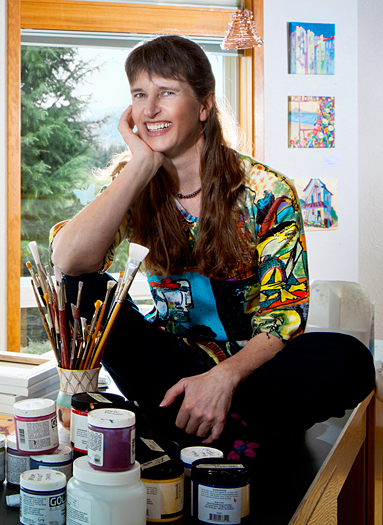 "Every day I look forward to going into my studio to paint. I always begin with an idea in my sketchbook, then turn to the canvas with my composition worked out. I am interested in creating joyful paintings with clean color, in a playful way sometimes using abstraction, imaginative color or inventing shapes to achieve this. Although my paintings have identifiable subject matter, I am more interested in pattern, design, and color than realism. Please visit me in my studio to see my sketches and finished paintings."